Product Management Journal, published by Product Focus, is the only publication geared the to the Telecoms and IT product management community. Its goal is to is to help product managers and product marketers do a better job. Published, twice a year, each issue targets a specific theme in the world of product management, and takes an informative approach to exploring issues and providing insights and solutions. The latest issue, entitled Agile and its impact on product managers, revolves around the themes of agile and scrum. It features two in-depth articles detailing the workflows and methodologies of each agile and scrum. Product managers in all fields will benefit from reading the opening article entitled “Everything you need to know about Agile.” Complete with easy-to-understand explanations of the pros and cons of Agile development, the different types of Agile methodologies and visual flowcharts that clearly illustrate the different types or product management approaches, this article provides product managers with a clear insight on when to adopt Agile practices, and when to stick to traditional ones. The same can be said about their article on Scrum, entitled “The rules and its impact on the product owner.” The article serves as a resource for product manager, covering each phase of the sprint planning processes within the Scrum framework and mapping out the outcomes for the product owner. Informative components of the article on writing requirements and tracking work in a Sprint make this article must-read for all product managers. The issue also features a checklist to help product managers get the most out of Agile and Scrum, and list of tools that help manage requirements and Agile project. OneDesk is proud to have been included in the list of helpful software tools! Our social marketing specialist, Catherine, is pictured at the right just after receiving her copy of the issue. 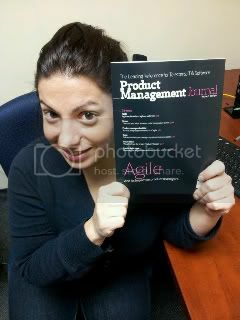 For more information on Product Management Journal and how to obtain a free copy, visit Product Focus’ website. We want to know: What challenges does your company face when it comes to implementing Agile and Scrum methods?